Although the food is not too shabby in Nepal, there is a severe lack of variety and it gets old very quickly when you are trekking. The staple items on a trekking guesthouse menu are variations of: potatoes, pasta, rice and bread. For example, you can get noodles (pasta) with egg, noodles with veg and egg, noodles plain or noodles with chicken (if you're lucky). Same goes for the other carbs. Since we were on a 33-day trek, these options got boring rather quickly so we'd get really excited about new items. 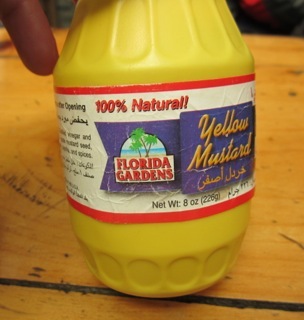 We only found it ONCE at a restaurant so we ordered burgers to go with the mustard. Most condiments are basically constrained to ketchup, salt perhaps some pepper and that was really it, unless honey counts. I normally would not have yellow mustard- opting instead for a more proper stone ground or at least a dijon. But, haveing seen no mustard in more than a month, it was a great find! This one was from Florida, USA out of all places. 2. Salad [that doesn't give you diarrhea]. Fresh vegetables are almost unheard of so finding a salad is like hitting the jackpot. Once you find it, it won't be that amazing though, as it will be mostly cabbage, onions, some carrots and tomatoes. 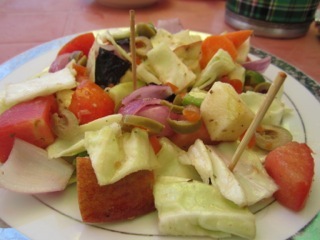 The best salad I ever had was an 'israeli' salad that had actual oil and vinegar; this was in Muktinath. It's best not to eat raw vegetables though. I found out the hard way when I ordered my third salad during the trek and had severe food poisoning. Fresh vegetables should be washed with iodine water and it's not always done. The result, of course, is ingesting various sorts of contaminants that will get you sick in no time. Even canned fruit was extremely difficult to find. Coming across fresh fruit only happened once to us in the town of Tatopani (tato is hot and pani is water in Nepali; Tatopani has natural hot springs, quite naturally!). Sometimes they would store apples and serve the with our breakfast porridge or fry them up as apple fritters (or in the unfortunate apple salad which consisted of chopped up apples completely smothered in mayonnaise [note: I hate mayo]). We were so excited about the fresh fruit that we had it for dinner and we also bought 10 bananas to bring along with us for the next few days. Most of the yoghurt is home made and was very hard to find. 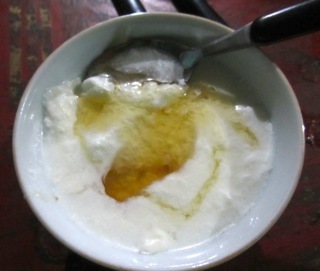 We found it once in the eastern region of Upper Mustang and it was delicious! 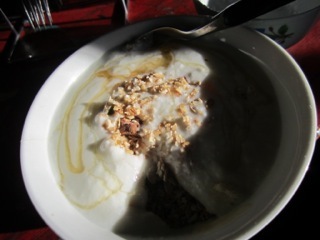 We had it for dessert after dinner and then pre-ordered it for breakfast with muesli the following morning. We make out own yoghurt at home and we were really missing it so this was a real treat! ... and topping it off w/muesli, yes! 5. 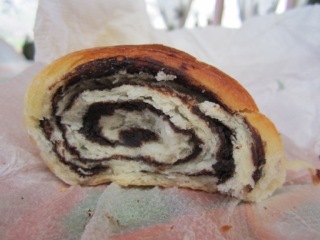 Dark Chocolate Swirl Croissant. What? Hells yes! We found this delicious pastry at a quirky cool place called Yac Donald's in Kagbeni. They have an extensive menu and offer all kinds of fresh yak meat. Fresh yak meat is not always available. Even though there are a lot of free range, grass eating yak, many areas (such as Manang) do not kill yak for consumption, they only eat the meat if the yak has died (e.g. old, dead meat). Anyway, back to the croissant: it was actually a legit croissant and I savored every single bite. The dark chocolate in lieu of crappy milk chocolate was a complete but welcoming surprise. 6. Organic fresh brewed coffee. NOT instant coffee. That's a great start. Organic, freshly ground and brewed coffee was proudly brought to us by Yac Donald's in Kagbeni which was a nice break of the tea routine even though tea in Nepal was absolutely delicious. Major score! Thanks again, Yac Donald's! 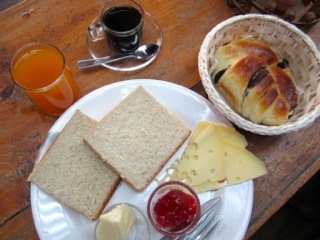 We also had fresh seabuck thorn juice, yak cheese and organic toast to go along w/the coffee! I never drink soda because I have a really hard time stomaching the insanely unhealthy amount of sugar in it. 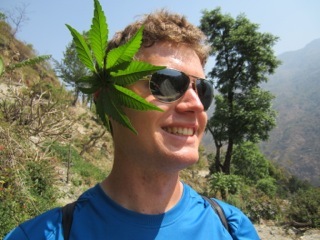 However, Nepal was a huge exception (I think we were burning plenty of calories each day to justify it). My stomach was unhappy for at least 30% of the trek and those ice cold bubbles and the rush of caffeine and the slight sugar high was just an amazing feeling when I was feeling so crappy. 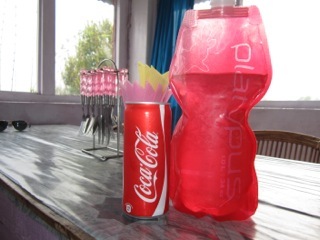 Coca-Cola has Pepsi beat in Nepal! Marpha is a cute little town full of apple orchards and there are tons of home-made apple cider. Marpha was the first town we walked to after we finished our Upper Mustang portion of the trek -- and it marked the beginning of our ABC portion. 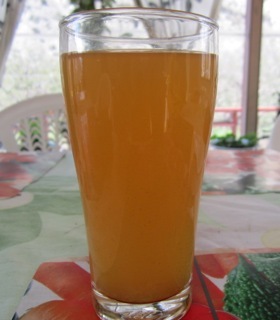 Apparently, a group of Germans helped to teach the locals how to make cider from apples. 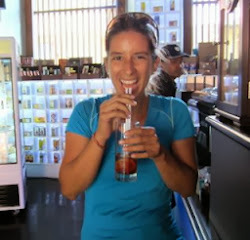 We bought a few bottles that we carried with us in our Nalgene to our next stop. I had never seen these before! 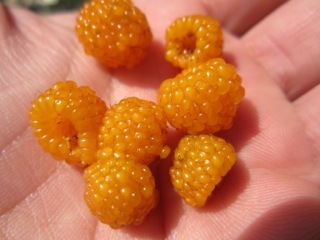 We picked them off a bush and they tasted delicious! The taste was actually more like a raspberry/blackberry hybrid - not too sweet or tart, just right. 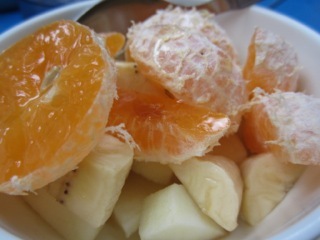 Whatever it was, it was so refreshing to just have something raw and fresh. 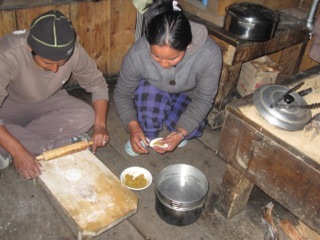 We didn't technically find it, we suggested the chef at our guesthouse in Lower Pisang make it. And she did! Although she refused to try our strange concoction, the chef agreed to make it. She stuffed a dumpling with minced apple and spices. She steamed the dumplings and then we ate them with honey - what a delicious treat! No, we didn't smoke it or eat it but we were actually surprised to find so much marijuana growing everywhere. After all, it's a weed! Those wild raspberries are called Aiselu. My absolute favorite.